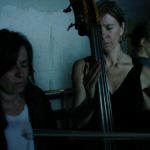 Marina Rosenfeld is a New York-based composer, artist and turntablist, working at the intersections of composition and improvisation, sound and visual art. 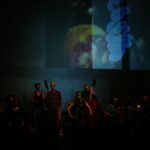 Her work has explored the social and situational contexts of music-making, digital/analogue culture, and experimental or open forms in a variety of formats. 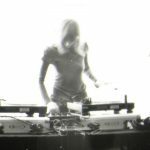 As a turntablist, she has developed her distinctive sound by playing exclusively her own custom acetate records, or "dub plates", which are imprinted with original, fragmentary sounds she mixes and manipulates live. 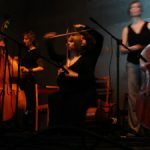 She's also noted for a series of large-scale performance works developed in situ, often featuring non- or amateur musicians with whom she develops custom performance strategies (The Sheer Frost Orchestra, Emotional Orchestra, WHITE LINES). Rosenfeld performs frequently in the U.S. and Europe, and has performed with leading contemporary artists, including Merce Cunningham Company, Sonic Youth, Christian Marclay and Laurie Anderson. 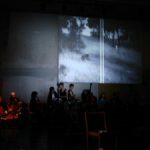 Rosenfeld's work has been presented in a wide variety of contexts including by the Whitney Museum of American Art, the Tate Modern Museum and festivals including Donaueschingen, Ars Electronica, Maerz Musik, Mutek, Wein Modern, and, in November, Taktlos Bern. Her most recent release is "joy of fear" (2006, Softl/Cologne).